There are both similarities and differences. First, you may note that today’s paper has a more vertical profile. The 1971 Tribune was about 15 inches wide and 23 inches deep; today’s paper is more like 11 by 21. 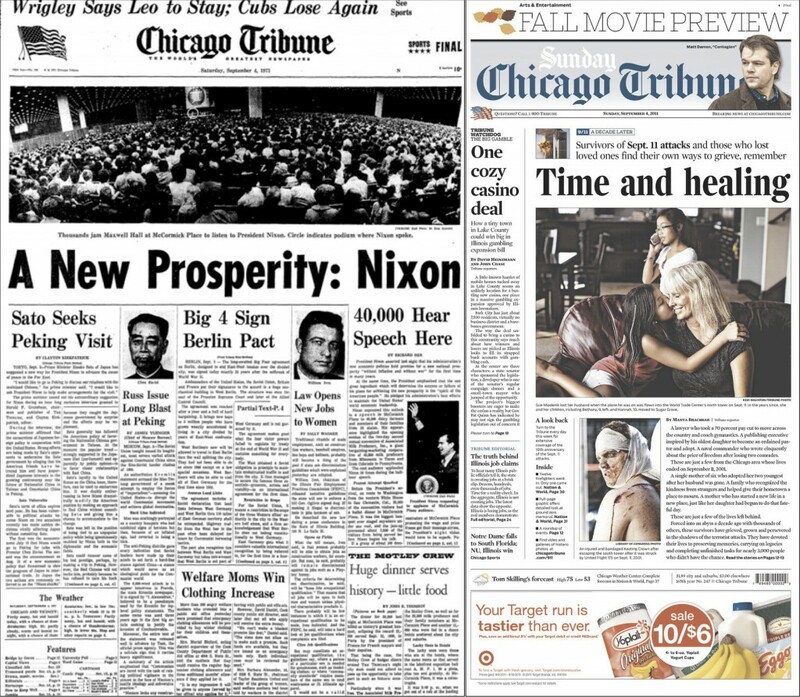 Second, you may note that the 89-pica-wide photo of a McCormick Place crowd listening to President Nixon shows that big photos are not necessarily a latecomer to Chicago front pages, though of course big photos in color appear way more regularly today. Of course, one difference is that the President’s speech was about “a new prosperity.” Current Presidential speeches seem to have a different economic tone. You can’t miss the weather. And there’s nothing like a “Cubs lose again” headline to make a Chicagoan remember that the world is still spinning on the same axis today as when Leo Durocher was the current and future manager, two years removed from the pennant that was not to be. There are other obvious things to compare, like story count, color, and the different kinds of people favored with head shots. Or that the Saturday paper was then a dime, not a dollar (in 2011 terms, that would be about 55 cents). But finally, do not fail to note that the 1971 masthead noted that for your dime, you got to read “The World’s Greatest Newspaper.” Inspiration enough, don’t you think, for a new copy boy to show up for the 3 to 11:30 p.m. shift. that day? And then to continue showing up, on a fairly regular basis, for the 37 years that followed. Decided to look at your Blog and were we surprised! Very interesting. Brings back memories.